This is me back from my German travels and I am so tired. And cold, it is pretty cold over here. My Dad is actually snowed in! Everywhere in Wigtonshire and Northern Ireland just looks so horrible and euuugh. 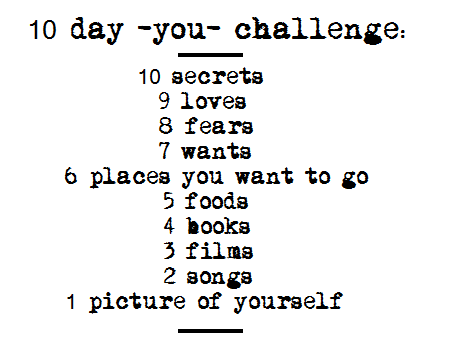 Let's do this- 8 Fears. I am a wimp. The dark is scary, this is a fact and everyone knows this. 2 - Failing at life. This is scary too. I am hypermobile so I am bendy, and I have some history of dislocations. They are so so painful- especially my knees and it is scary sore. This one is pobably my most legitimate fear. 4 - Losing the people I care about. Pretty standard fear I think. 5 - Getting very seriously ill.
6 - Hmm, struggling to think now... Losing my teeth! Oh my god this is so scary for me. I have nightmares about this. I have total teeth OCD. Hate it. 7 - Losing my hair. Another vain complaint. I just think my face is too horrible to be able to suit being hairless well. I lack the bone structure and the pretty features. 8 - Being in a car crash.